Tonight, I had the great pleasure of sailing with the Wagner team on board the 41 foot, Der Baron, and what a cool team it is, so in sync with each other and comprised mostly of family and a few good friends. 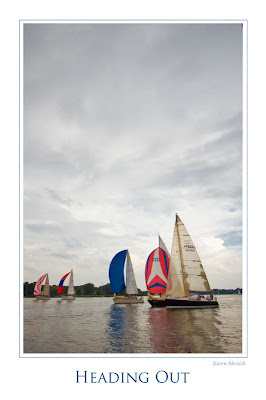 I was fortunate to gain a possible spot on a race boat in the Maryland Governor's Cup this weekend. Don Wagner, the captain of Der Baron, whom I was paired up with through the St.Marys organizers, suggested I sail in advance of the Big Race, to make sure I was comfortable with sailing on board and to make sure he was comfortable with me sailing on board as the overnight race is quite a challenge and can last up to 15 hours, in stormy weather and good. This also gave me an opportunity to get a feel for what type of images I might be able to create and how nimble I could be crawling around the deck shifting from side to side with a Nikon D2X strapped around my neck. Forget the lens cover..it would have popped off in no time. Forget changing the lens ever...so I mounted the 12-24 and stuck with it. 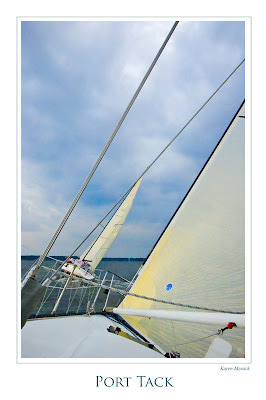 I wondered if we would even sail as the weather forecast was looking a little dangerous with a tornado forecast for Anne Arundel County, but off we went..very cool. I love storms and dark clouds, much more interesting than clear blue! 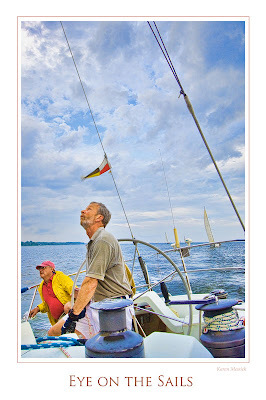 We had a good sail and missed first by 16 seconds! As the race was wrapping up we could clearly see a storm heading our way, the crew moved quickly to the dock and we made it in just before the skies broke loose. 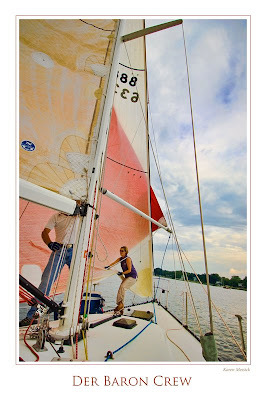 After the sail Don said he would be fine with me on board for the race on Friday and Saturday. He filled me in a little about shooting and I will not be able to take any shots after dark with a flash because night vision is so critical to a successful race, looking out for buoys with no lights, crab pots and flotsam, all of which can drag down the speed and do damage. So I will get to shoot until sundown and will stow the camera overnight until sunrise. I enjoyed a nice dinner at The Pirates Cove with the team and family. What a fun time. Thanks Don and team Wagner! Looking forward to the weekend.